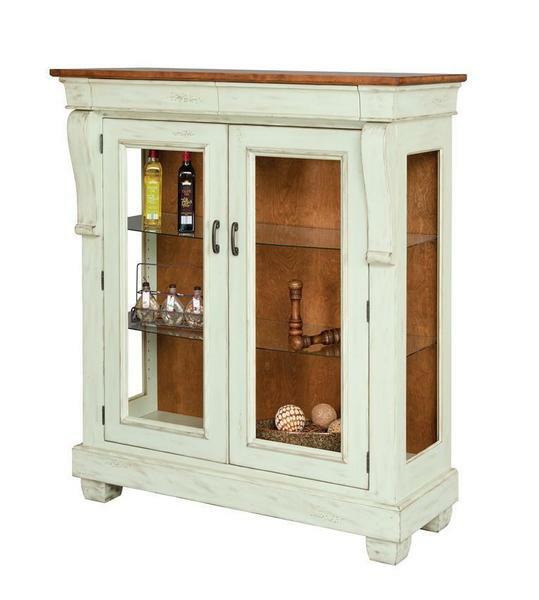 The Amish Hartford French Country China Cabinet features the perfect combination of wood stains and paint highlights. It has primary aesthetic is a charming rustic beauty, but it also possesses a modest elegance attributed to it's 2 fashionable, handcrafted corbels. Moreover, the Amish Hartford China Cabinet features 2 hidden drawers for style, or for security. Hide valuables, or simply fashionably store fine silverware, or wine accessories. This French Country China Cabinet t is built to order and inspected at multiple stages of development. Amish woodworkers rigorously strive to maintain their reputation as the best, and this includes only releasing work that is completely clear of material and workmanship defects. If you have any questions regarding the Amish Hartford china Hutch, feel free to contact DutchCrafters at 1-866-272-6773. Please call to speak with a furniture specialist for custom doors.